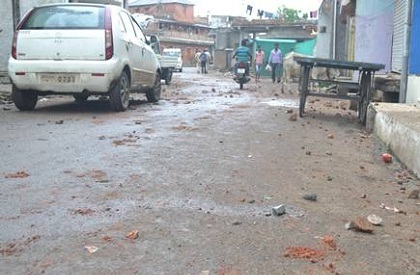 Communal clash over the last rites of a man led to violence and tension in Shajapur in Madhya Pradesh. People came out on streets, pelted stones and there was confrontation. The police had to lob tear gas shells, fire in air and use force to control the situation. After the violence, prohibitory orders were issued. Section 144 has been enforced in the town in order to control the situation. Police said that the trouble began when a person died and the family members began preparationf or burial. The person belonged to Mahupura in the town. The residents were digging the grave, however, this led to a row. A section of residents objected and said that the spot where the grave was being dug, was outside the graveyard land. There was altercation and soon both sides came out on streets. Slogans were raised from both sides. There was heavy stone pelting and police had to use tear gas. The police force was rushed to the area. Collector and Superintendent of police (SP) also reached the spot. Policemen had to use force to control the situation. Later, religious heads of both communities were called and tempers were calmed down. The administration urged people to not pay attention to rumours. The burial took place at a different place, later. The police said that the situation is now under control. Locals were told that it would be examined if the particular place where the grave was dug, fell outside the graveyard land or was part of it. Patrolling is on and police force is deployed in the town as a precautionary measure.